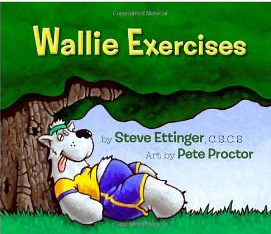 Wallie Exercises is an award winning children’s book that encourages young children to get active. My boys and I spent some time reading it yesterday and I have the scoop for you! First, what do you think? Can an exercising elephant help a lazy dog get fit? You’ll get the answers in this lovely book by Steve Ettinger with art by Pete Proctor. Wallie is a wonderful dog, but his laziness has become quite a problem. His boy convinces him to go on a fitness adventure. The story follows Wallie on his journey to get fit, while learning important fitness concepts. After you’ve read the story a special section follows that goes over the exercises in detail so that every kid can be as excited as Wallie when exercising. I’ve got a tough crowd here, but it’s a good one. My oldest (8) loved it! He laughed and enjoyed the illustrations very much. He was interested in the special section and wanted to learn more about exercising. My youngest (6) said, “I liked it a little.” He is in a super hero phase and if there is no super hero it’s a tough sell. He did enjoy the illustrations and thought the idea on an elephant training a dog was funny. What did this mom think? At first I had some reservations about the overweight dog lying on the couch watching TV with food all over the place. Some people actually live like that I was a bit concerned about what they would think. I guess everyone needs a health wake up call at some point. I loved how the author introduced the concepts of Warm Ups, and Hydration and how they relate to exercise in a kid friendly manner. The exercises in the special section are fun and easy to do with your little ones. I also love how Edwin, the elephant, encouraged Wallie to try exercising his own way. A fun book about getting active! Disclosure: I was sent a copy of this book for review. Once again, the thoughts here are my own!